Your own sleeping bag, if you prefer. Sleeping bags will be available at Wat Nawamin. We recommend that you bring clothing selected for comfort rather than style. Weather in Massachusetts is extremely variable. Outdoor temperatures may be warm enough for shirt-sleeves or cold enough for heavy sweaters, sometimes within the same day or week. It is hard to predict, so come prepared with layers of clothing, extra blankets, rain coat, rubber boots or other footwear for rain and mud, and versatile clothing. Layers of comfortable, modest, non-binding clothing for the duration of your stay o White or light colored clothing is traditional in Thailand for this type of meditation, so it is recommended but not required. o Pants or skirts that cover your knees while you are seated are acceptable. Please bring a sufficient supply of clothing to last the duration of your course. Laundry facilities are available only for hand washing of clothes. Seasonal outdoor wear: raincoat, umbrella, boots, hat, warm clothing. 1 kind of fruit or vegetable if you are choosing to fast for 1-3 days at the beginning of the retreat (or longer). If you plan to fast, please bring your own fruits or vegetables (one type) for the period you plan to fast. In keeping with the precept for abstaining from eating after midday, there will be no food provided in the evenings, including on the first evening, May 18th, before the retreat begins. You may bring a snack for that one evening, if you like, as long as it does not require cooking or refrigeration. You may bring juice or other non-alcoholic drinks for the evening rest periods during the retreat, as long as they do not require cooking or refrigeration. Please contact Carol with any questions, needs, or concerns before May 14th: phraajahnssecretary@yahoo.com or (413) 549-0581. Please read this information document completely before applying. Please allow time for the application to be received by Wednesday, April 20, 2016. 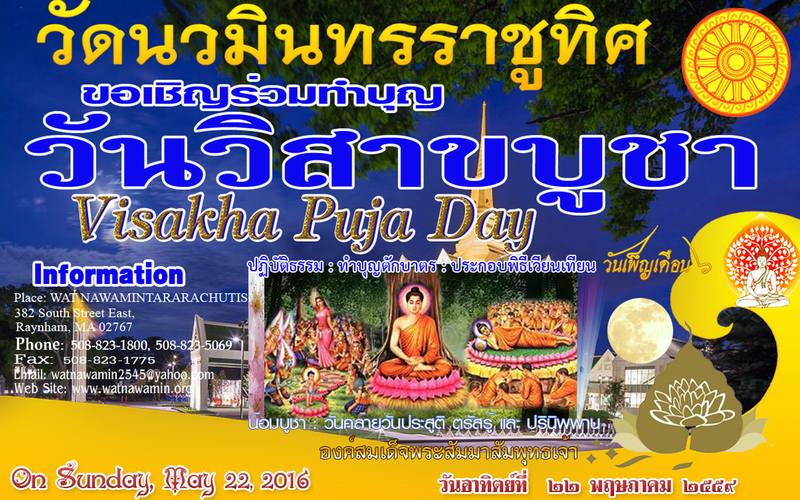 Plan to arrive at Wat Nawamin between 1:00 p.m. and 4:00 p.m. on Wednesday, May 18, 2016. We will all begin the course together at 6:00 p.m. The course ends at 6:00 a.m. on Thursday, May 26, unless you have made prior arrangements to leave earlier. If you need to leave early, please indicate the date you are leaving on the application. For directions to Wat Nawamintararachutis, see https://www.google.com/maps/place/Wat+Nawamintararachutis+Meditation+Center/@4 1.894845,-71.034,16z/data=!4m2!3m1!1s0x0:0xf1864e6ec1231d4f?hl=en-US. If you need a ride or can offer a ride, please email Carol at phraajahnssecretary@yahoo.com. If you have questions before May 13 about the course, please email Carol at phraajahnssecretary@yahoo.com. Indoor tenting is recommended for privacy if you have a tent that is suitable for setting up indoors. Alternatively, there is space available in shared rooms, most likely three people in each room (but this will depend on number of retreatants). Indicate your preference, along with any special requirements, on the application. Please note: There are no beds at Wat Nawamin, but sleeping bags are available for your use. You may bring your own sleeping bag, if you like, plus padding, such as a mat or an inflatable mattress. We will send you information about what to bring at a later date, after we have received your application. Vipassana is one of India’s most ancient meditation techniques. Long lost to humanity, it was rediscovered by Gautama the Buddha more than 2500 years ago. The word Vipassana means seeing things as they really are. It is the process of self purification by self observation. One begins by observing the natural breath to concentrate the mind. With a sharpened awareness one proceeds to observe the changing nature of body and mind and experiences the universal truths of impermanence, suffering and egolessness. This truth realization by direct experience is the process of purification. The entire path (Dhamma) is a universal remedy for universal problems and has nothing to do with any organized religion or sectarianism. For this reason, it can be freely practiced by everyone, at any time, in any place, without conflict due to race, community or religion, and will prove equally beneficial to one and all. Vipassana meditation aims at the highest spiritual goals of total liberation and full enlightenment. Its purpose is never simply to cure physical disease. However, as a byproduct of mental purification, many psychosomatic diseases are eradicated. In fact, Vipassana eliminates the three causes of all unhappiness: craving, aversion and ignorance. With continued practice, the meditation releases the tensions developed in everyday life, opening the knots tied by the old habit of reacting in an unbalanced way to pleasant and unpleasant situations. Although Vipassana was developed as a technique by the Buddha, its practice is not limited to Buddhists. There is absolutely no question of conversion. The technique works on the simple basis that all human beings share the same problems and a technique which can eradicate these problems will have a universal application. People from many religious denominations have experienced the benefits of Vipassana meditation, and have found no conflict with their profession of faith. The process of self purification by introspection is certainly never easy. Students have to work very hard at it. By their own efforts students arrive at their own realizations; no one else can do this for them. Therefore, the meditation will suit only those willing to work seriously and observe the discipline, which is there for the benefit and protection of the meditators and is an integral part of the meditation practice. Nine days is certainly a very short time in which to penetrate the deepest levels of the unconscious mind and learn how to eradicate the complexes lying there. Continuity of the practice in seclusion is the secret of this technique’s success. Rules and regulations have been developed keeping this practical aspect in mind. They are not primarily for the benefit of the teacher or the course management, nor are they negative expressions of tradition, orthodoxy or blind faith in some organized religion. Rather, they are based on the practical experience of thousands of meditators over the years and are both scientific and rational. Abiding by the rules creates a very conducive atmosphere for meditation; breaking them pollutes it. A student will have to arrive in time for the beginning of the course but may leave early by prior arrangement. Students are encouraged to stay for the entire period of the course. The other rules should also be carefully read and considered. Only those who feel that they can honestly and scrupulously follow the discipline should apply for admission. Those not prepared to make a determined effort will waste their time and, moreover, will disturb others who wish to work seriously. A prospective student should also understand that it would be both disadvantageous and inadvisable to leave before the agreed time, such as leaving the course upon finding the discipline too difficult. Likewise, it would be most unfortunate if, in spite of repeated reminders, a student does not follow the rules and has to be asked to leave. People with serious mental disorders have occasionally come to Vipassana courses with the unrealistic expectation that the technique will cure or alleviate their mental problems. Unstable interpersonal relationships and a history of various treatments can be additional factors which make it difficult for such people to benefit from, or even complete, a nine day course. Our capacity as nonprofessional volunteers makes it impossible for us to properly care for people with these backgrounds. Although Vipassana meditation is beneficial for most people, it is not a substitute for medical or psychiatric treatment and we do not recommend it for people with serious psychiatric disorders. The foundation of the practice is sila — moral conduct. Sila provides a basis for the development of samadhi — concentration of mind; and purification of the mind is achieved through panna — the wisdom of insight. to abstain from telling lies; 5. to abstain from all intoxicants. Students will observe the sixth precept by having a beverage at the afternoon break. The teacher may excuse a student from observing this precept for health reasons. The seventh and eighth precept will be observed by all. Students must declare themselves willing to comply fully and for the time they attend the course with the teacher’s guidance and instructions; that is, to observe the discipline and to meditate exactly as the teacher asks, without ignoring any part of the instructions, nor adding anything to them. This acceptance should be one of discrimination and understanding, not blind submission. Only with an attitude of trust can a student work diligently and thoroughly. Such confidence in the teacher and the technique is essential for success in meditation. During the course it is absolutely essential that all forms of prayer, worship, or religious ceremony — fasting (other than what is recommended, below), burning incense, counting beads, reciting mantras (unless recommended by Phra Ajahn), singing and dancing, etc. — be discontinued. All other meditation techniques and healing or spiritual practices should also be suspended. This is not to condemn any other technique or practice, but to give a fair trial to the technique of Vipassana in its purity. Any doubts or confusion which may arise should always be clarified by meeting with the teacher. Problems or questions regarding the meditation should be taken only to the teacher for clarification. 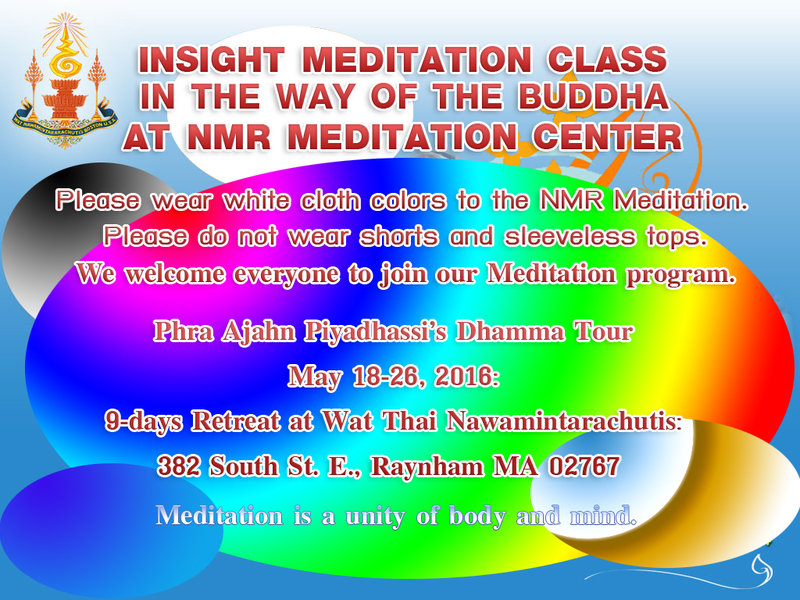 There will be times for questions, and you may also request a private interview with Phra Ajahn. Interviews and question times are solely for the purpose of clarifying actual practical problems concerned with the technique. They are not to be regarded as opportunities to indulge in philosophical discussions or intellectual arguments. The unique nature of Vipassana meditation can only be appreciated by putting it into practice and during the course students should concentrate exclusively on this task. Please do not point your feet toward Buddha statues or toward the teacher while seated for meditation or question times. All students must observe Noble Silence from the beginning of the course until the morning of the last day. Noble Silence means silence of body, speech, and mind. Any form of communication with fellow student, whether by gestures, sign language, written notes, etc., is prohibited. Students may, however, speak with the teacher whenever necessary and they may approach the management with any problems related to food, accommodation, health, etc. But even these contacts should be kept to a minimum. Students should cultivate the feeling that they are working in isolation. No drugs, alcohol, or other intoxicants should be brought to the site; this also applies to tranquilizers, sleeping pills, and all other sedatives. Those taking medicines or drugs on a doctor’s prescription should notify the teacher. It is not possible to satisfy the special food preferences and requirements of all the meditators. Students are therefore kindly requested to make do with the vegetarian meals provided. If any students have been prescribed a special diet because of ill health, they should inform the management at the time of application. It is recommended that students eat only one type of fruit or vegetable, plus juice, for the first three days of the course, unless their health does not permit it. This is recommended but not required. If you plan to fast, please plan on bringing your own fruits or vegetables (one type) for the period you plan to fast. Three days is the recommendation, but longer may be possible in some cases. Please indicate your plan on the application. Please wear light-colored clothing as much as possible. This is recommended but not required. No washing machines or dryers are available, so students should bring sufficient clothing. Small items can be hand washed. Bathing and laundry may be done only in the break periods and not during meditation hours. Students must remain within the course boundaries throughout the course. They may leave only with the specific consent of the teacher. No outside communications is allowed before the course ends. This includes letters, phone calls and visitors. In case of an emergency, a friend or relative may contact the management. According to the tradition of pure Vipassana, this course is run solely on a donation basis. Donations will be accepted for the teacher and for Wat Nawamintararachutis. Wishing to share these benefits with others, one gives a donation according to one’s means and volition. Whether a donation is large or small, it should be given with the wish to help others. To clarify the spirit behind the discipline and rules, they may be summarized as follows: Take great care that your actions do not disturb anyone. Take no notice of distractions caused by others. It may be that a student cannot understand the practical reasons for one or several of the above rules. Rather than allow negativity and doubt to develop, immediate clarification should be sought from the teacher. It is only by taking a disciplined approach and by making maximum effort that a student can fully grasp the practice and benefit from it. The emphasis during the course is on work. A golden rule is to meditate as if one were alone, with one’s mind turned inward, ignoring any inconveniences and distractions that one may encounter. Finally, students should note that their progress in Vipassana depends solely on their own good qualities and personal development and on five factors: earnest efforts, confidence, sincerity, health and wisdom. May the above information help you to obtain maximum benefit from your meditation course. We are happy to have the opportunity to serve, and wish you peace and harmony from your experience of Vipassana. The following is a sample timetable. The actual timetable may be different. The timetable for the course will be designed to maintain the continuity of practice. For best results students are advised to follow it as closely as possible. The course will start at 6:00 p.m. in the evening of the first day, Wednesday, May 18th, and will finish at 6:00 a.m. in the morning of the last day of the course, Thursday, May 26th. During rest periods you may take a shower at your own convenience. NOTE: The course begins at 6:00 p.m. the evening of the first day of the course. Or email* the information to phraajahnssecretary@yahoo.com. *Please note: We will share information only with Phra Ajahn and the small group planning the retreat. We will do our best to maintain privacy, but privacy in email or other electronic media cannot be guaranteed. If you do not want us to share your information electronically, please let us know. Special notes: Do you have any special needs that we should know about; do you need to bring any medications, medicine, supplements, or vitamins; or is there anything else you would like to say? Please be sure to read the agreement and sign on the next page – thanks! I will bring __________ (type of fruit or vegetable) for fruit/vegetable fasting for ____ days. I agree to stay on the course site and to abide by all the rules and regulations for the duration of the course. I realize that a Vipassana meditation course is a serious undertaking that will require my full mental and physical health and I affirm that I am fit to participate in it. I hereby certify that the information on this application is true to the best of my knowledge. Congregation assembles for a group photograph. Please Practice the Dhamma in a temple :pay respect to monks, chant, listen to homilies, circumambulate, and meditate.